Do you ever feel like it will take a miracle for your dreams and desires to manifest the way you want them to? I want you to know that miracles manifest every day for people all over the world. All it takes to manifest miracles is applying a few simple principles from the Law of Attraction. 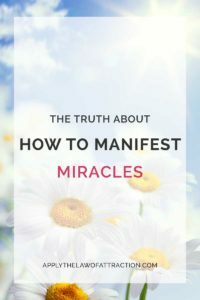 Have you ever manifested miracles in your life? I'm asking because I often hear from people who started using the Law of Attraction with a desire to transform one or more areas of their life. But things didn't really work out the way they intended, causing them to lose faith and belief that the Law of Attraction works. So what are you supposed to do when it happens? I have a few tricks I've learned over the years that will help you manifest miracles in your life. These tricks really help you make the Law of Attraction work for you, turning it into your secret weapon if you will. Get very clear on exactly what it is that you want to manifest. Make a list of everything you are looking for to make you happy. For example, if it's a job, make a list of everything in a job that would make you happy – location, job tasks, salary, co-workers, management, etc. Make sure you include how you want to feel. Using the job example above, how do you want to feel in your job? Respected? Appreciated? Valued? Happy? Put it all down! If you have trouble coming up with what you want, take a piece of paper and make a list of what you don't want. Take another piece of paper and write the opposite, thus making a list of what you do want. You can gain even more clarity by taking a third piece of paper and writing why you want it. Spend time every day visualizing your desire. Really experience what it would be like to manifest your miracle before it has even happened. Immerse yourself in this feeling. As little as 5 minutes a day is all it takes. So often you hear the phrase, “You'll believe it when you see it.” But to manifest miracles, you're going to have to shift you're thinking a bit. You need to believe your miracle is yours (has manifested) before you will see it. The more you capture the feeling of having your dream, the more you will believe it is yours. And the more you believe it, the faster you will see it. It often helps to achieve this state of believing by feeling happy about your goal and life in general, and by feeling gratitude for the things and people in your life. When you believe to the point that you are certain of the outcome, you are able to wait (and wait) without anxiety. You don't feel the need to check your watch every few minutes to see how much time has passed. You aren't wondering when your miracle will manifest or where it's at. You trust that the Universe has a plan for you to manifest miracles. You know it has its own timetable and whatever that is, it's fine because you KNOW your dream will show up. You're able to surrender all attachment, and to sit back and trust that your miracle will manifest when the time is right. It's normal to have doubts and fears, but don't let them control you. When they come up, work on releasing them. Denying or burying them can can create energetic roadblocks that put a stop to the manifesting process. Do your best to eliminate them. Ask the Universe to guide you to what will best clear your blocks to manifesting miracles. It may bring you actual tasks, assignments or opportunities to clear your resistance and limiting beliefs. Whatever it brings you, remember that it is there to help you heal so that you can manifest more miracles in your life. I encourage you to follow these steps to manifest miracles so that your dreams become your reality, now! Ooooh! I love Denise! She is amazing! What an awesome deal! I love this! Especially the part about surrendering trust. I finally get what detachment means. It means TRUSTING that what you want is yours – without worry or fear. Awesome post Elizabeth! Great to see you back.